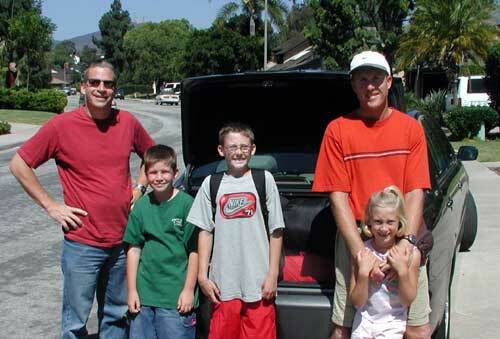 Keith and Doug pick up Bennett, Russ, and Kolby Bird for a car pool to San Pedro. This was the trip (Camp Fox) that Russ used to convince Keith to join YMCA Indian Guides 2 years ago. We had gone the previous two years in November, helping our nation gain a little seniority so when another nation in a more favorable weekend slot gave up their yearly reservation, we could grab it. In other words, we had paid our dues. And that more favorable slot did come open, and our nation did move from November to September after just two years. This was to be Bennett's last event as a Y Guide, and Russ's first and only attempt at pulling off the oft-attempted but seldom successful dual Father-Son/Father-Daughter camping trip. 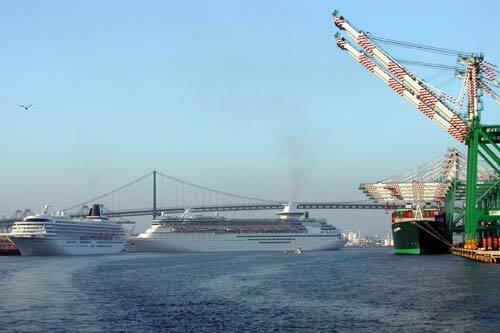 The Los Angeles Harbor (San Pedro) is one of the largest and busiest in the world. To watch the enormous container ships load and unload (it is done simultaneously, it seems) by the equally fantastic cranes and realize that this gigantic ballet is a foundation of our economy is awesome. That's captured here, as well as the elephantine cruise ships that are so many times larger than the cruise ship we took for our honeymoon to Alaska 13 years ago. Finally, there is also the bridge, under which lies the Catalina terminal from which we have just departed. 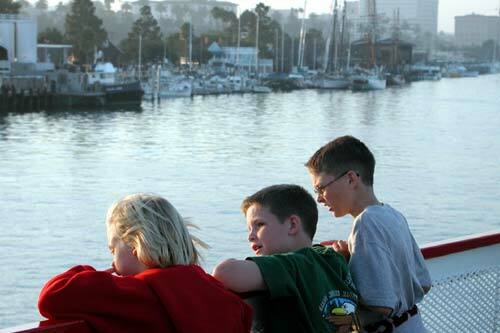 Kolby, Doug, and Bennett watch from the third floor as the Catalina King slowly exits the harbor. 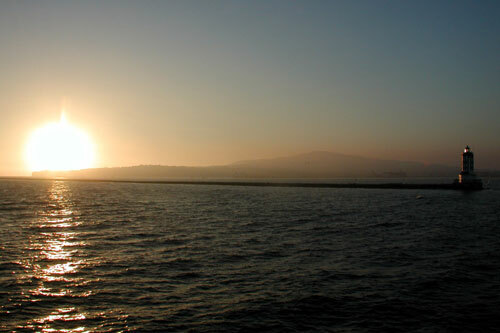 Here's a view you never get when you leave after dark in November: the sun setting over the harbor breakwater and Palos Verdes. 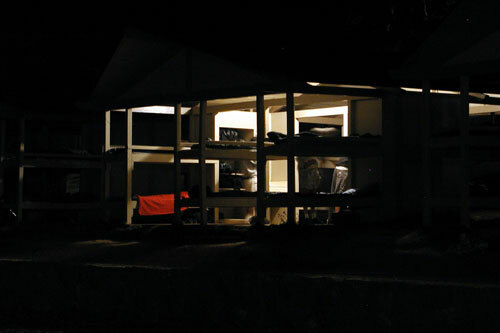 The first difference between Camp Fox in September and November was obvious before we even walked off the pier: the canvas sides of the beach villas, always there in November, were gone! We had always felt a little exposed without doors; now we didn't even have walls! I have to admit the Camping Curmudgeon made three separate appearances this evening (but was then absent for the remainder of the weekend! ): once at orientation when a child (not from our tribe) spilled his hot chocolate and he, his dad, and his tribe just walked away from the mess; once immediately after orientation when an unaccompanied, older child went exploring a building that had just been clearly labeled off limits 10 minutes earlier at orientation; and finally, at midnight when he got up from his bunk and asked the dads in the next cabin to take their animated conversation further away than 10 feet. The Camping Curmudgeon is amazed that people don't clean up after themselves, figure that rules clearly stated don't apply to them, and blythely yammer on without considering all the people in the very near vicinity they could be disturbing. Mind you, Keith is perfectly aware that he undoubtedly offends the sensibilities of others from time to time. He hopes that he can respond in kind when approached graciously about any grievance. Not likely, but he hopes. Questions or comments? Write keith at virtualsherwoods dot com.